HALLOWEEN has always been a night for ‘Wild’ costumes and pushing the boundaries of horror – but one St John’s resident consistently takes the crown for creepiest All Hallows’ dark doings. Faye Wildey, who each year transforms her Hermitage Woods Crescent home into a pit of petrifying frights, welcomed guests once more on Saturday night, scaring people stiff in exchange for a charitable donation. The big-hearted host was this year drumming up funds for DEBRA, the national charity that supports individuals and families aff-ected by Epidermolysis Bullosa – a painful genetic skin blistering condition which, in the worst cases, can be fatal. Faye is hoping the efforts of her and her crack team of scream specialists can raise £1,000. A spooky ancient mummy, vampires (such as Hannah Masharqa, left), a psychotic surgeon and ghastly ghouls from beyond the grave skulked in the shadows as brave souls weaved through Faye’s haunted home at the weekend. Everyone who entered made it out alive, but only after surrendering their screams to the rafters. Lending a hand on the night were Edward Moore, Joshua Townsend, David Stacey, Jacob Woodcock and Dan Harrington in various guises, while technical wizard Jeff Parkhouse sprinkled added suspense behind the scenes with his lighting and sound effects. To help Faye Wildey reach her fundraising target, simply go online to justgiving.com/halloween15 now. by a man without any! Michael Plowman was one of the many stars of a spooky horror show put on by mum Debbie at her haunted home on Saturday night. 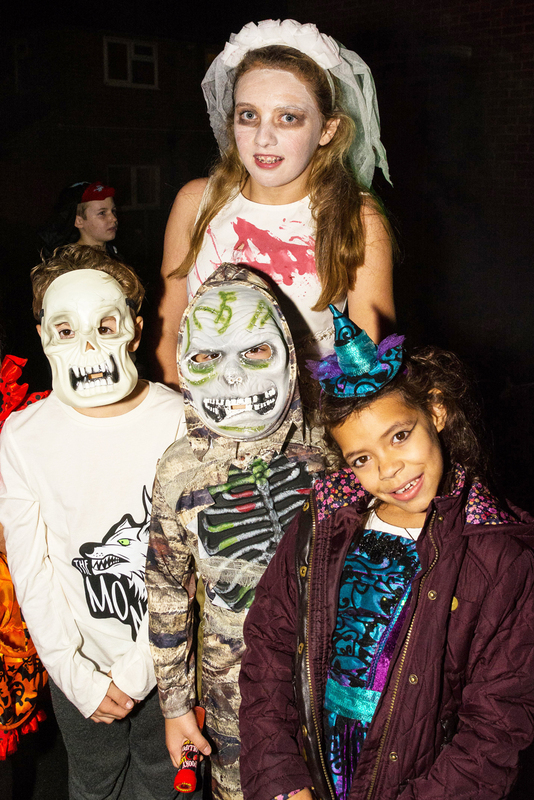 Skeletons, witches, ghouls and other nasty things that go bump in the night took to the streets over the weekend to scare locals out of their socks and collect sweet treats. But top of the bill for residents was a trip to Debbie’s nightmare home, kitted out with everything to have the hairs on the back of your neck running for cover. 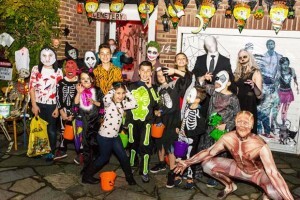 Debbie is clearly a huge fan of All Hallows’ Eve and uses the night of fright to fundraise for the Welmede charity – a ‘person centred’ housing and support organisation passionate about helping people with disabilities to pursue their chosen lifestyle. Guests paid a donation to test their resolve in the face of Debbie’s carefully orchestrated horrors. Among the pick of the costumes was a frighteningly silent Slender Man – a fictional, supernatural character resembling a thin, unnaturally tall man with a blank and featureless face, wearing a black suit.